I would like to selectively open specific links in a new browser window from an out-of-the-box SharePoint "Links List". SharePoint "links lists" are very handy. The only problem is that out-of-the-box, the links take over the browser window. While desirable for some navigation tasks, it is not always optimal. Sometimes I use a Content Editor Web Part to make custom links, but these are not permission sensitive the way SharePoin Lists can be. There is a 3rd party web part add-on called "Windows Links" for WSS3/MOSS2007 (see this article) that works just fine, but it requires an installation of the web part. This can (and probably will) cause issues during an upgrade to the next version of SharePoint. ...which prompted me to look for another solution. Fortunately, I ran across this solution from an old blog. I credit Ricky Spears for originally posting this solution, however, the original code contained a text wrapping error. "Wmhogg" in a comment (from the original post) had pointed this out. (Nice catch Wmhogg!). So the code provided in this tip is both corrected and condensed. The basic idea is that Link List is added to a Web Part Zone on a site page or web part page. Then a Content Editor Web Part is added (anywhere) onto the same page. The code is entered into a Content Editor Web Part using the "Source Editor" (not the Rich Text Editor), as pictured below. 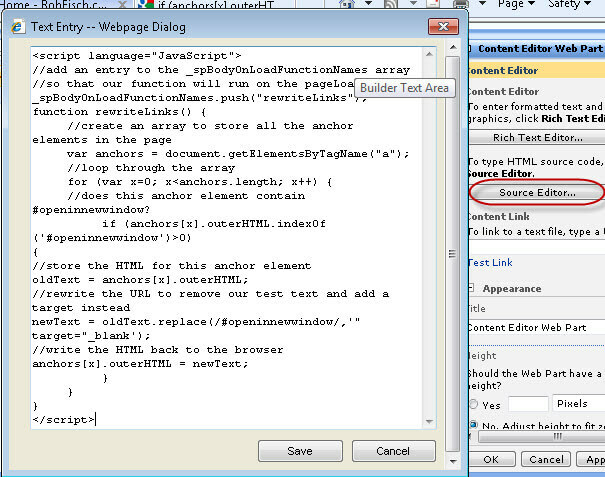 The Content Editor Web Part can be hidden if desired (look in the "Layout" section of the web part options). And finally, when creating links in the Links List, add #openinnewwindow on the end of each link that you would like to open in a new window. Review the article on the Content Editor Web Part. See "SharePoint Links List To Pop Up New Window" article using Windows Links.